You must be logged into Windows as an Administrator or have your computer's administrator account password to hand in order to install and run the software. It is also recommended that you temporarily disable any antivirus software you may have running prior to installing the software to ensure it installs correctly. 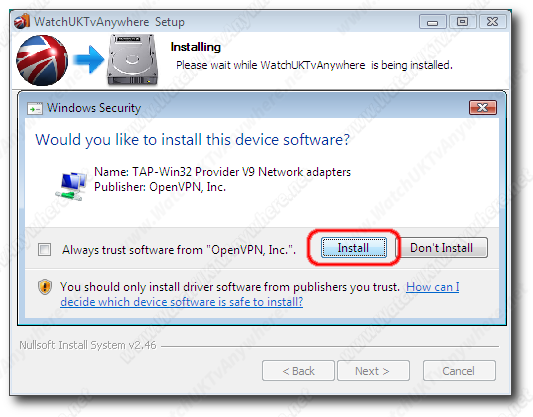 Download and Save "Watch UK Tv Anywhere.exe" application installer and then start it by double clicking the installer icon. Make sure you confirm the TAP-Win32 Network Adapter - Windows may complain that it have not passed Windows Logo testing. This is nothing to worry about and is perfectly normal. Simply click Install.